L I V I A: [LET'S TALK ABOUT THE SUMMER ESSENTIALS] FEAT. MEDIK8 VITAMIN C DAY CREAM + BLISTEX SPF30 LIP BALM + LIP PROTECTION! [LET'S TALK ABOUT THE SUMMER ESSENTIALS] FEAT. MEDIK8 VITAMIN C DAY CREAM + BLISTEX SPF30 LIP BALM + LIP PROTECTION! Getting summer ready is essential when it comes to protecting your skin and lips. Always ensure that you are using products that can provide your lips with the best sunscreen protection such as the Blistex SPF30+ Lip balm and Lip protection products. Also, when it comes energising tired looking skin, try a cream that includes Vitamin C and E, just like Medik8 C-Tetra Cream. Recently, I looked to check out two awesome Blistex lip products that both contain SPF 30+ which is so important for the lips, especially during summer in Australia (where it can get quite hot over here). Our lips are the most delicate when it comes to the skin and most importantly, it should be mostly protected everyday. 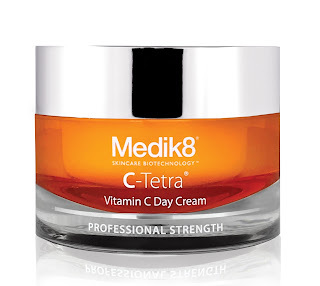 As for the Medik8 Vitamin C Day cream, I've found that it looks to hydrate, renergises and brightens the skin with continued use. It's really fast absorbing and this is definitely a lovely moisturiser to use on the skin for everyday purposes. It keeps my skin feeling more plump and hydrated. For more information regarding both of these brands, be sure to scroll down to check out more. Blistex Ultra Lip Balm SPF30+ (Blue coloured lip balm) - RRP $3.95 - Comes with intensive protection from the Sun, Wind and Cold. It helps to moisturise the lips whenever it is feeling dry or chapped. The fact that it has SPF30+ is definitely a life saver because it has that high broad spectrum that I need for everyday. The lip balm is also made water resistant for up to 80 minutes, which means that it stays on the lips for longer than other lip balms, before looking to re-touching the lips once again. This is the perfect handbag essential to have, so take note guys! Just so you guys are aware, the Blistex Ultra is available at Woolworths, Priceline, Chemist Warehouse and other leading pharmacies nationally. Blistex Five-Way Lip Protection SPF30+ (Gold coloured lip balm) - RRP $3.95 - These are available at Coles and leading pharmacies nationally. This is lip protection against nature's harshest conditions, so essentially this ensures that you get the fullest protection against any dryness, coldness, heat, wind and the sun (most importantly). There is a high SPF30+ of very high broad spectrum. This lip balm is made with five ingredients which help to defend your lips against harsh environmental factors. There's also Calendula present in this lip protection's formula which means that you get the best comfort to your lips, whilst any chapped part of your lips is instantly soothed. This is a very luxurious, moisturising and really fast absorbing cream for the day. It contains Vitamin E and C, which means that you receive the necessary antioxidants for your skin which is so essential for anti-ageing and skin brightening purposes. Also, if you're looking for that extra radiance and glowing to your skin, then it's ideal to use a moisturiser that contains the essential antioxidants. The cream is also formulated with hyaluronic acid which helps to support the skin's natural barriers, plus it looks to hydrate and energise the skin. I'd say it's a very nourishing cream which doesn't leave your skin feeling dry or flaky which is so important for me, especially when it comes to Spring and Summer. My skin can totally be unpredictable as it's combination to oily skin, so for me personally, I loved how it left my skin feeling so hydrated. Plus, with continued use of the day cream over a longer period, what you'll essentially find is that your collagen and elastin will be much healthier and stronger. Furthermore, this moisturiser does not contain any fragrances and comes paraben free. So if your skin is ever looking or feeling dull and tired, the best cream or life saver to the rescue has to be the Vitamin C Day cream as it provides a boost of hydration to your skin as well as supporting your skin's natural barriers. You can essentially look to purchase this online at http://www.medik8.com.au/cosmeceuticals/c-tetra-cream/ or via Advanced Cosmeceuticals or visit their official website at www.medik8.com.au for more information. Have you checked out any of the above summer essentials yet? Thank you U by Blistex and Medik8 for supporting me for this review. My reviews are based on my personal and true experiences. I only recommend products that I truly support.